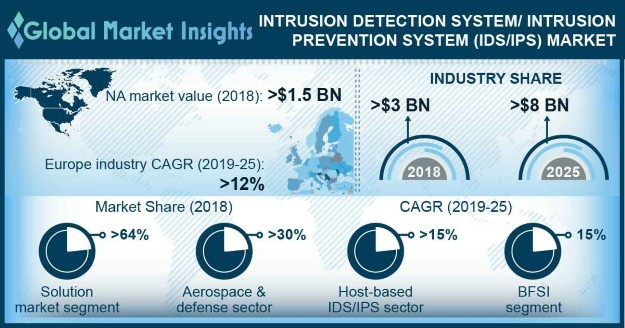 Intrusion Detection System / Intrusion Prevention System (IDS / IPS) Market size is set to exceed USD 8 billion by 2025; according to a new research report by Global Market Insights, Inc.
Government globally are making strategic investments in protecting the country’s cyber health driving the IDS / IPS market demand. For instance, in January 2019, the UK government announced to invest USD 112 million in cybersecurity related R&D. The government aims to eliminate many cyber threats by designing advanced security solutions thereby reducing the cyber risks for services and business. The Belgian government has also proposed a new investment plan named the National Pact for Strategic Initiatives under which the government plans to invest USD 16.8 billion in ICT security between 2019 to 2030. These government investments will help the enterprises in developing a secured computing environment eliminating the threat of cybercrime. The network-based IDS / IPS accounted for a share of over 24% in 2018 in the global intrusion detection system / intrusion prevention system market. This system is used for monitoring and analyzing network traffic to safeguard the system from network-based threats. It enables organization to use limited devices for monitoring large networks augmenting their adoption rate. It provides improved visibility across the network, making it easier to meet the security regulations. The systems can also automate hardware inventories reducing labor cost and improving efficiency augmenting their demand in the global market. The on-premise deployment model dominates the intrusion detection system / intrusion prevention system (IDS / IPS) market with a share of over 50% in 2018. The on-premise IDS / IPS assists businesses to control the flow of information as well as its storage efficiently thereby offering enhanced protection to the IT infrastructure. These systems also help in safeguarding the network from attacks protecting private and customer data and facilitating seamless and secured communication inside company and remote users. However, due to the enhanced flexibility and scalability offered by cloud-based IDS / IPS solutions the demand of cloud model is expected to grow significantly over the forecast period. The BFSI sector is predicted to grow at the fastest rate in the IDS / IPS market growing at a CAGR of 15% between 2019 to 2025. The BFSI industry deals with huge bulk of financial data facilitating insurance, transactions and related financial services to its customers. These financial institutions are prone to huge cyber crimes and physical risks, thereby demanding enhanced security solutions for the industry. The rising adoption of advanced technology, electronic platform, internet, cloud, and mobile banking have created an increased susceptibility to cyber threats to the critical data of the banking customers. This has enhanced the requirement for implementing next generation IDS / IPS solutions in the banking sector. The Europe IDS / IPS market is projected to grow at a fast rate with a CAGR of over 12% during the forecast timeframe. The market in this region is anticipated to grow at a fast pace due to a rise in the number of public-private partnerships and government investments to deploy the IDS / IPS in various points of network system. For instance, the European Union Commission has launched a public-private partnership on cybersecurity that is expected to trigger USD 2 billion of investment by 2020. The UK holds a strong position in the Europe market due to the growing adoption of cloud in public sector institutes by the UK government driving the growth of intrusion detection system / intrusion prevention system (IDS / IPS) market. Furthermore, in January 2019, UK government revealed more than 1.7 billion records leaked in the January month through data breaches and cyber-attacks in turn accelerating the market demand. The key vendors operational in the IDS / IPS market are Cisco, IBM, Dell, Juniper Networks, HP, Huawei, Symantec, Trend Micro, Imperva, McAfee, Sophos, Extreme Networks, and BAE Systems. Companies operating in the market are consistently involved in developing and commercializing advanced intrusion prevention systems. For instance, in January 2017, Trend Micro, one of the leading global providers of security protection solutions, announced the availability of TippingPoint NX Series Next-Generation Intrusion Prevention Systems (NGIPS). The solution can deliver up to 100 GB inspection throughput with low latency.